Designed to offer space, comfort and luxury; our resort rooms have stylish interior design infused with a warm ambiance. 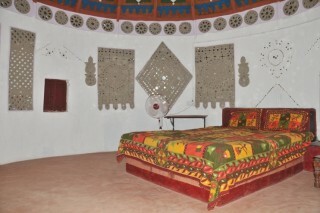 The ambiance of all the rooms have been made to give a modernized look but in a very traditional and systematic manner. The rooms are well equipped with necessary amenities to make your stay restful. 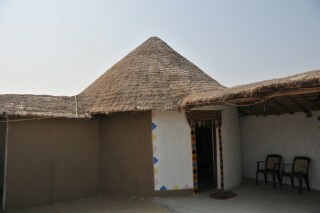 You can experience the rich heritage of kutch while staying in traditional Bhungas. 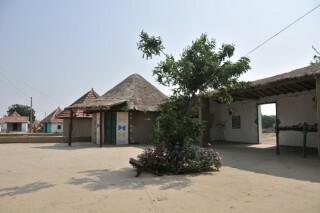 A unique experience of the charm of staying in kachchhi mud huts – bhungas, with mud walls, mud floor. The Bhungas are deigned to bridge ethnicity with modern day needs. Experience The Kutch at its colourful and exotic best during the Rann Utsav in Every December, Kutch, Gujarat, India. Our property is an ethnically designed eco-resort, set among wetlands and agricultural fields. The property has imaginatively designed cottages that blend with the rural countryside in which it is situated. 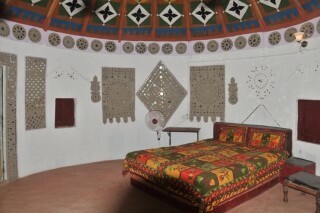 Located near Dhordo village and the bhunga (Rooms). decorated with mirrors, mud-plaster work and embroideries., it makes the ideal base to explore the culture, weaves and handicrafts of the Kutch district. Facilities : Attached bath with running cold/ hot water Laundry Service 24 Hrs Room service Check Out 24 Hrs Housekeeping Doctor on Call Western Toilet Embroidery Handicraft Kutchi Folk Music Served Pure Veg. Indian Breakfast, Lunch & Dinner. Nearby Attractions/Things to do : White Desert : The Great Rann of Kutch, is a seasonal salt marsh located in the Thar Desert in the Kutch District of Gujarat. Dhordo Village, 80 kms from Bhuj is now renowned as one visited for its desert with a white sheen, for being the the largest salt desert in the world. The White Sheen on the desert is unique and therefore attracts visitors in large numbers. 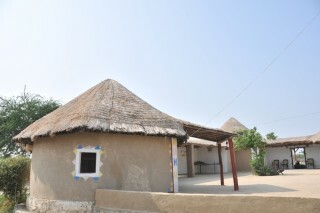 Dhorodo village is also centre for Mutua embroidery (small mirrors, leather embroidery and silver jewellery). 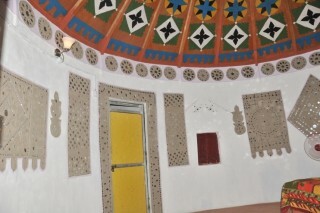 Guests can puchase handicrafts directly from the artisans here. Kala Dungar : Kala dungar is a hill and the highest point in Kutch area which is home to a locally significant Lord Dattatreya temple. The hill offers excellent views of the desert around. Perfect place to stay to experience the local culture. Host was very friendly and funny. Food was delicious, traditional Kutchi food. 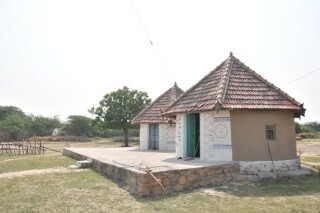 Property is 28km away from the tent city of Rann of Kutch. Host entertained us with traditional music night too. Would like to stay again with them. Thank you, GuestHouser!